Last week many of us were transfixed by the amazing images of the solar eclipse that blazed a path across the U.S. from Oregon to South Carolina. Here in Seattle we were not plunged into darkness but it was still an amazing experience. A couple of weeks ago, we were just as impacted by the hazy smoke which blanketed Seattle curtesy of the horrific wildfires in British Columbia to the north. The red sun that greeted us each morning and evening and the red glow around Mt Rainier as we returned from our European trip are indelibly imprinted on my memory however. witnessed the break away of the largest iceberg on record. Overwhelming? Yes. Daunting? Yes. Powerless to do something? No. Walk more. Walking is not only good for our bodies it is good for the earth. Many of us walk for our health, but we can intentionally walk so that we cut down on our use of cars too. Since Tom and I decided to walk 10,000 steps a day we more frequently walk to the grocery store. What other local errands could be walked to rather than driven to? Use public transport. On our recent trip to Europe we relished the use of buses and trains. We did not need a car. This is a little more challenging in the U.S. but a growing number of urban dwellers find they too can do without a car. It is good for their budgets as well as the health of the earth. Buy a bike. A growing number of cities are becoming bike friendly. This is a great way to get around. It saves energy, causes no pollution and is good exercise. Commit to alternative energy. Electric cars, solar panels on houses, encouraging renewable energy production by our utility companies are always to reduce the polluting effects of coal and oil. Make your house energy efficient. We recently added insulation to our attic space and added ceiling fans. It has helped keep the house cooler in the summer and warmer in the winter. Having an energy audit done of your house is one simple way to help reduce energy consumption and bring a small measure of healing to the land. Cut your water consumption. I grew up with low flow toilets and shower heads and was amazed when I moved to the U.S. to find that these were not in regular use. That has changed but there are still many homes that have not made the move. And in the garden moving to drought resistant plants and adding thick layers of mulch are simple ways to cut the need for watering. Stop using herbicides and toxic chemicals. Both in the house and the garden the use of toxic chemicals contributes to pollution of land and water. Baking soda and vinegar are our best friends – killing bugs and cleaning surfaces. This website as some good simple recipes for cleansing solutions. Eat locally & reduce the meat. Some of us are reluctant to go vegetarian, but can still reduce our energy consumption by eating locally grown meat. The shorter distances our food has travelled, the less energy is consumed and the more healthy it is for the environment. Recycle creatively. I love to think about ways to reuse furniture, containers and waste products, and such recycling has become an art. Before you throw something into the land fill, search Pinterest for creative ways to reuse it. You might be surprised at the possibilities and delighted with the fun results. Buy less, Make Your Own. I have always been a believer in home made food, clothing and even toys for kids. There is something very satisfying about making something ourselves. And when we make it or grow it ourselves we don’t want to throw it out so we become less consumptive too. We grow about 40% of our own vegetables and fruit. I still make my own granola, yoghurt and baked goods, dehydrate fruit, make preserves and marinara sauce. Have great fun in the process and joy in the product. Sit prayerfully for a few minutes and think about your own life. 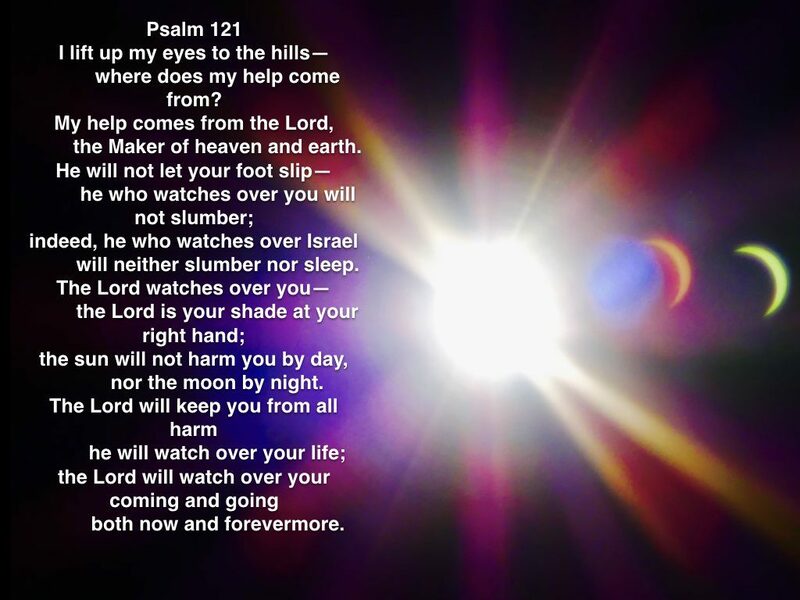 Watch the video of the eclipse below and then read through Psalm 121 above. As God watches over you what are the implications for your stewardship of creation? What are some simple steps you could take to reduce your eco footprint and help heal the land?